Yes, I’m on a strawberry kick. It’s too early for local strawberries, but the grocery stores are selling early berries from California, and when I walk into the store and see the lovely red berries on display I absolutely cannot resist. So yesterday I pulled out my tart pan and started working on this dessert. 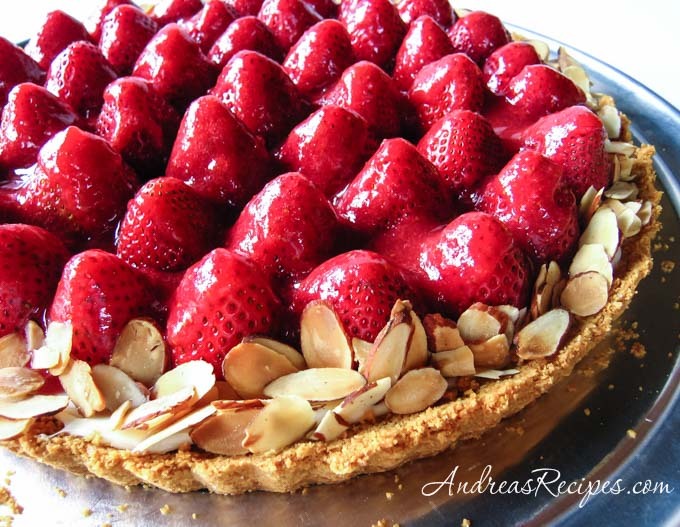 With so many strawberries and the pretty red glaze poured all over them, the tart looks very elegant and tastes scrumptious, too, perfect for a Mother’s Day dessert or a weekend brunch. This strawberry cream tart recipe uses a graham cracker crumb crust, which is very easy to make, but it’s crumbly (pun intended) and tends to mix in with the cream cheese filling. To help keep the crumbs on the bottom where they belong, I spread a thin layer of cream cheese on the bottom and let it set, then I spread the remaining filling on top of it. There was still a few stray crumbs here and there, but for the most part they stayed put. It’s a good make ahead dessert, because you can make the crust, filling, and glaze up to 2 days ahead and then assemble the tart on the day you plan to enjoy it. The recipe makes a bit too much glaze, but leftovers are delicious on ice cream or poured over a bundt cake, so don’t feel the need to leave your tart swimming in glaze. CRUST: Put the graham crackers in the food processor bowl and process until completely crumbled. Add 2 tablespoons sugar, the melted butter, and water and pulse just until moist. Press the mixture into the into bottom and up sides of the prepared tart pan. Bake at 10 minutes or until lightly browned. Cool completely on a wire rack. GLAZE: Place 2 cups of strawberries in the food processor or a blender. Process until pureed. Stir together the strawberry puree, 2/3 cup sugar, and cornstarch in a small saucepan over medium heat. Bring to a boil, stirring constantly. Reduce heat to low and cook for 1 more minute. Remove glaze from heat and cool to room temperature, stirring occasionally. FILLING: In the bowl of the stand mixer, combine the cream cheese, 1/4 cup sugar, vanilla extract, and almond extract and mix until smooth. Using about 1/3 of the mixture, spread a thin crumb layer over the bottom of the tart shell and allow it to sit for a few minutes. When that layer is set, spread the remaining cream cheese mixture evenly over the bottom layer. ASSEMBLE: Add prepared strawberries and lemon juice to the medium bowl, and toss to coat. Starting at the outside edge of the crust, arrange the berries, bottoms up, in a circular pattern over filling. Spoon glaze evenly over berries. Sprinkle the toasted almonds around the edge. Cover and chill for 3 hours before serving. Total Time includes 3 hours refrigeration time after tart is finished. You can make this in either an 8 x 12-inch rectangular pan or a 9-inch round tart pan. According to Cooking Light, the recipe also works with a 9-inch springform pan and a 10-inch pie plate. Thanks Rosa and Johanna! And yes, those are sliced unpeeled almonds, which fortunately are widely available in the U.S. I buy large bags of them from the local warehouse clubs because I use them all the time in salads and desserts. I must confess that I used way more than the 2 tablespoons that the recipe calls for simply because I like them so much. I didn’t even measure, I just used a couple handfuls.